Some salons are doing "microblading" services off the radar, and women are paying the price. They were thick and they were black. One was crooked. “I’ve got these black caterpillars on my face,” Lynne Young, a Belchertown resident, told NBC10 Boston Investigators. Microblading is a relatively new, delicate technique for an old procedure to either draw missing eyebrows, or fill out thin brows. But confusion and fly-by-night operations abound in Boston, as the city scrambles to stay ahead of a hot trend and to prevent potentially serious injury. Odds are, if you just picked a microblading place in Boston, you would wind up in an unlicensed business. The NBC10 Boston Investigators found that more than half of the businesses that advertise microblading were not licensed by the city. And once we started asking questions, the Boston Public Health Commission dispatched inspectors to check on licenses, ordering two unlicensed salons to stop offering the service. 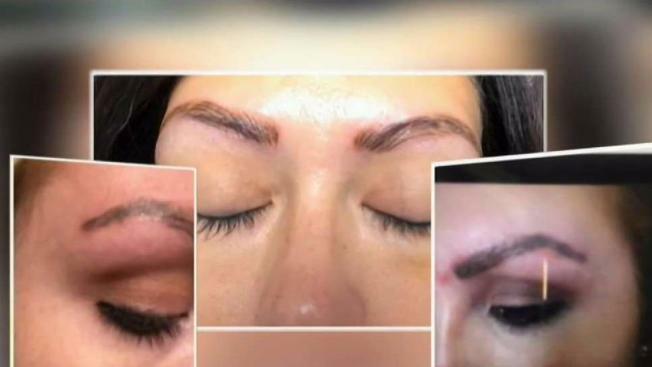 One salon told NBC10 Boston it was unaware it needed an establishment license and said in a statement it would no longer offer microblading. Young was not injured when she had lines inked on her brow. But she was referred to someone by a family member, and got the work done in a dentist’s office for a few hundred dollars, much lower than what licensed and trained professionals charge. Young did not want to name the person or the place she went to. Microblading cuts ink directly under the skin of eyebrows to permanently give them a fuller look. However, there are many risks if you choose the wrong place to get it done. She was not happy with the work, and ultimately sought out a tattoo removal specialist for several procedures to have it reversed with a laser. Beauty blogger Christina Hernandez said her microblading session left her swollen and aching. “I was just embarrassed...I made a huge mistake,” she said. It is done with small blades dipped in ink that puncture the outer layer of skin to deposit pigment underneath. State and Boston city regulators consider microblading to be tattooing, and the city requires both practitioners and the establishments where they work to be licensed. The NBC10 Boston Investigators searched for establishments just in the city of Boston that advertise offering the service, and found 11. We then checked those businesses against the list of establishments licensed to host body art and piercing. Of those 11, six were not licensed. The state Office of Consumer Affairs and Business Regulations said that tattooing and body piercing are licensed and inspected at the local level, meaning each city and town is responsible for the tattoo shops within their borders. In Boston, the Public Health Commission licenses body art establishments and practitioners. The hurdles for practitioners to obtain a license are high: blood-borne pathogen training, waste disposal, equipment sterilization training, evidence of experience, apprenticeship, and other requirements. Rob and Eve Harris founded Disappearing, Inc., in 2015. They specialize only in tattoo removal. They don’t do tattoos or microblading. Rob Harris said he and his wife see one or two clients per week to fix or remove “poorly-done” microblading jobs. The licensing also comes with inspections, meaning both practitioners and establishments are checked for sterility, cleanliness, and training. The public health commission also sent out a letter to salon across the city on Nov. 8, noting that “permanent makeup, microblading, and piercing are all forms of body art” and must be done according to city health and licensing regulations. But the commission appeared to not follow up on the letter. The NBC10 Boston Investigators asked Shoemaker on Jan. 30 how many businesses health inspectors have checked on. “We have not gone into any,” Shoemaker said. “We haven’t found any yet,” he replied. NBC10 Boston Investigators presented Shoemaker with our list, complied using Google, Yelp, and Groupon. He checked several against his list of licensed establishments, including a business in Charlestown that offered microblading for $229. Most licensed microblading salons charge between $750 and $850 for the work and a touchup appointment. Subsequently, the public health commission said on Feb. 7 that it ordered two establishments to stop offering microblading. One of those businesses, neither of which were not named, met with the commission to discuss city regulations. Indeed, when NBC10 Boston Investigators called salons early this month, one, RISE Beauty Studio on Newbury Street, said in a corporate statement it was unaware it needed an establishment license. The contractor, whose business is INKD by Enise, does not have a current city body art practitioner’s license, and did not return multiple emails and Facebook messages seeking comment.